Josh and Alex wanted to capture some fun 1st birthday photos for their adorable little boy, Jackson, so I headed on over one Saturday morning to catch this family having some fun together. We read books and played at home and then headed out to The Farm to enjoy a beautiful morning outside! Jackson is just adorable, and with his expressive brown eyes, you're going to fall just as much in love with him as I did! I can't wait to show you these!!! We started out with some BIG SNUGGLES on the couch reading and laughing! I love families that are this much fun together! After Jackson was comfortable with me, we headed out to The Farm. It was so helpful that Alex took the time to think of a fun place that mattered to her and Josh. Now whenever they visit, they will have the memory of the morning we went out to shoot photos there! I love when Mamas think of places that are both beautiful and meaningful! You will notice that Jackson has a 10,000 watt smile! He was one of the best laughers I have ever met, and was such a sweet little guy! I'm pretty sure anyone who meets him must fall in love pretty immediately! SUCH a cutie!! Ahhh!! Look at those baby lips! I just die!!! I happened to have a birthday banner from the birthday party I threw for my dog (don't judge me, it was adorable) and so I brought it so that we could get a festive 1st birthday photo! I think it turned out super cutely, don't you? After some fun and laughs, Jackson wanted to snuggle for a bit with mom and dad, so we found a patch of some BEAUTIFUL early morning sunlight and he got his snuggles! 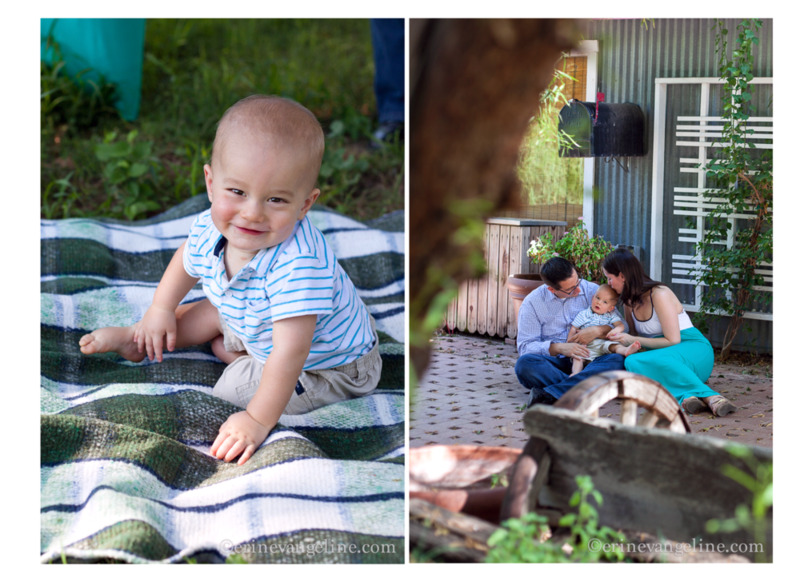 Thank you so much for trusting me to capture Jackson's 1st birthday photos, Alex and Josh! I had a great time, and I hope that you cherish the photos for years and years to come! You guys were so much fun to work with! !